Councillors on the community services scrutiny committee voted, at the end of November, in favour of its return for two more years. Following Tuesday’s demo and Committee Meeting, I left some breathing space before writing, although thank you to the dozens of people who not only emailed me with their appreciation of all the work done by all of you, but who have already started writing letters and thinking about the next step. The demo was fantastic – so many beautiful banners and hats – thank you to Gertie and Debbie and to all of those many creative people out there. 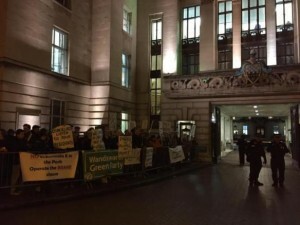 Like others, I was amused by the police presence – unnecessary, but it probably showed how nervous the councillors were. 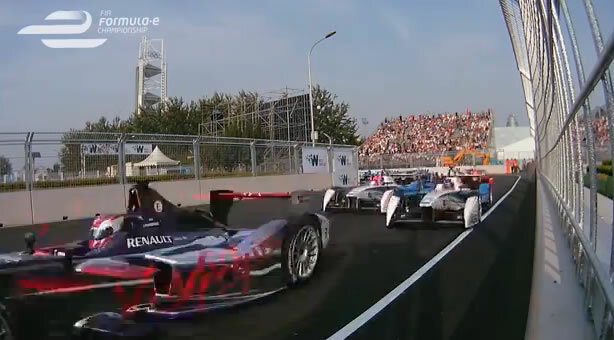 As you may know we had coverage on TV and local Radio. More tomorrow, I gather. The result was not unexpected, as most of us long term campaigners on various issues knew from experience it would be, but it is worth noting that there was a Tory abstention. If they had had the courage of their convictions, the result would have been 7:5. James Cousins spoke to another Tory  who said he was with us, but then “what can you do?”. As James said, you vote against it. That would have made it 6 all. We understand that there will be a “call-in” so the matter will be debated in full council meeting on 9th December. Seats available in the Public Gallery. It will also be posted in video form some days later. If the Labour Councillors and the Indies. stick to their guns, we should see a result of 37:22. Maybe more Tories will show some guts and be like James Cousins and the other two who voted against it last time. Our actions in the next few months will depend on the outcome of December 9th. We shall, of course, have another meeting; we may have to discuss tactics for the “set-up”. 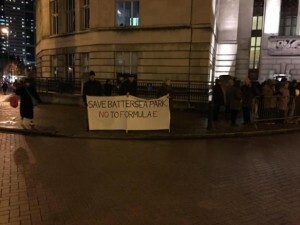 The council seems to believe there will be a rolling set-up, which could mean that 40% of the park would be unavailable to the public at any one time. We shall continue to challenge the sponsors. Some time ago we suggested we should do a head count of people in the park – easily done, as you just count them in. Why the council should consider it impossible, I do not know. I spoke to Frances Radcliffe on Tuesday, and she is all for setting up people from FBP to do this. I shall be calling on volunteers. It would involve a person on each gate, with a clip board, and possibly having separate columns for adult, child, buggy, dog, bike. These figures will be used to show that FE keeps out more people than attend than FE. The meeting, in many ways, was surreal. Most notable was Cllr. 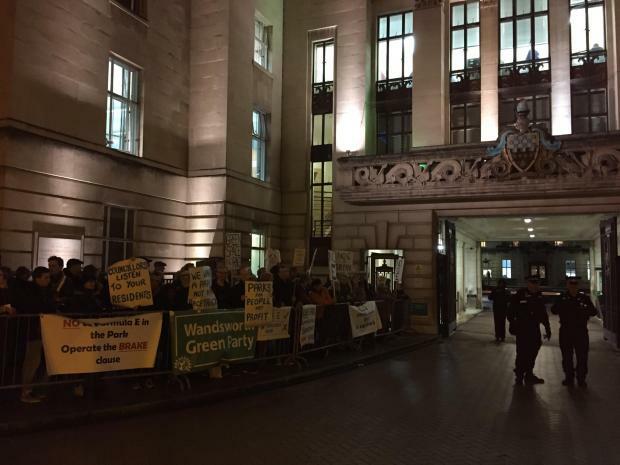 Ian Hart of Tooting – so lives near the leafy common – who first accused us of faking the petition signatures. It took quite a while before it was made clear that what he had been looking at was a Council website with various comments from the public. He failed to respond to John Fox’s challenge as to whether he was being accused of dishonesty, and nobody heard an apology. He later suggested that during the 3 ½ week disruption period, people could go elsewhere. Had he not noticed that at some point during the presentations a blind man and a woman who needs a stick to help her get around had been sitting across the table to him? Small wonder that Jamie shouted out “I’m blind”. Then there was Cllr. Torrington, a resident of leafy Putney, who declared that parks were a luxury. Does she have a garden, I wonder? Cllr. Cook made insulting remarks in the press, implying that people living on the edge of the park were nimbies, and that they would not have objected had they lived in leafy Hampstead. Still trying to get our heads round that one. However, unwittingly, there is a truth in what he said. If we believe that the Park is everyone’s back yard then, yes, we are all nimbies. Wear the badge with pride. Just over six months ago I received an unexpected breakfast visitor, who had seen my name on the Council website when I had objected to FE in the Park. We now have nearly 2800 signatories on the petition, a large database of addresses, and a core group of some 70 activists. The beauty of it is that the majority of these have worked on their own or in groups to write letters, create banners, challenge councilors in the Saturday Surgeries, research , advise and create reports on Health and Safety, Tree damage, wildlife licences, finance, send in Freedom of Information Requests, operate a Media and Press group, build and maintain our wonderful website, deliver leaflets and cards – to date around 11,000. The list is endless. I never fail to be amazed at the expertise and energy out there. There is no way anyone could be singled out for special mention – you all deserve medals. “Imagine having organised the largest campaign in recent (and no-so-recent) memory in Wandsworth and, at the end, you attend the relevant council committee: the opportunity for you to have your say. You’ve filled the public gallery, the overspill room is standing room only and, for the first time ever, the public are filling the council chamber to listen to a council meeting. And after the first resident deputation what is the Tory approach? 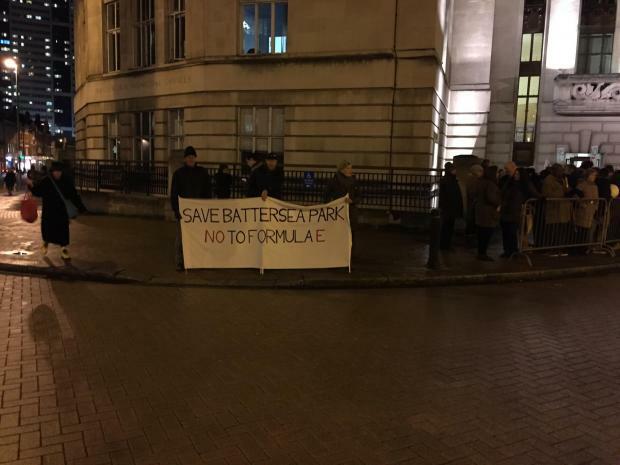 On Wednesday 9th December, Wandsworth full Council voted in favour of Formula E returning to Battersea Park, for the next two summers in an agreement including payment to Wandsworth of £200,000/year. That is is very strange comment made by a Councillors. Shall we say that Mr Govindia was elected as a Councillor last May 2014 by only 2134 voters, which mean “as a percentage of the Borough’s population of around 310,000, that is” 0.69%? Wow, the leader of Wandsworth Council is only approved by 0.69% of the Borough’s population?